A no drill or tap mount. Matches the factory hole spacing so you can install in just minutes without changing your rifle. Accepts all Weaver-style rings and accessories. 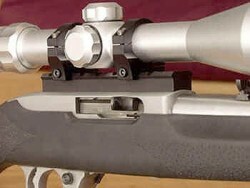 Scope and Rings shown are NOT included with mount.